Simon is one Latinised version of the name, the others being Simeon or Symeon. This practice carried over into English: in the King James Version, the name Simeon Niger is spelt Simeon (Act 13:1) as is Simeon (Gospel of Luke) (Luke 2:25), while Peter is called Simon (John 1:44). Ancient Greek: Σίμων (Simon). This name appears in Greek mythology as one of the Telchines. In Greek means "flat-nosed". Συμεών is the Hellenization of the name found in the Septuagint and parts of the New Testament, this form continues in use through the mediaeval era, viz. 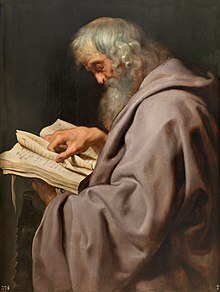 Symeon the New Theologian. Simon is a common name, and below is just a selection of notable people. For a comprehensive list see All pages with titles beginning with Simon. Simon Schama (born 1945), English historian specializing in art, Dutch, and French history. Simon Magus, magician confronted by Saint Peter and namesake of the term "simony"
Simon McKay, genius inventor played by David Rappaport on the CBS television series The Wizard. Simon Spier the main character in Becky Albertalli's novel Simon vs. The Homo Sapiens Agenda and recent film, Love, Simon. ^ Barnett, Paul (2002). Jesus & the Rise of Early Christianity: A History of New Testament Times. Intervarsity Press. ^ Lachs, Samuel (1987). A Rabbinic Commentary on the New Testament: The Gospels of Matthew, Mark and Luke. KTAV Publishing House, Inc.
^ Harper, Douglas. "Simon". Online Etymology Dictionary. ^ σιμός. Liddell, Henry George; Scott, Robert; A Greek–English Lexicon at the Perseus Project. ^ Walter Burkert, Greek Religion, Harvard University Press, 1985, p. 182. This page was last edited on 13 April 2019, at 18:48 (UTC).